This is the best midsize crossover for you if getting lots of safety and convenience features for your money is paramount. Model-year 2018 is a relatively quiet one for the Sorento; a more significant update on tap for model-year 2019 should include styling tweaks, revised drivetrains, and more standard equipment. For ’18, most Sorento models gain additional standard equipment, and there’s a new, no-cost option package for one of the entry-level trims. Kia launched the Sorento for model-year 2003, with traditional truck-type, body-on-frame construction. The second-generation Sorento debuted for model-year 2011, shifting to the crossover-standard unibody design and growing to accommodate up to 7 passengers. Today’s third-gen version arrived for model-year ’16, with underskin components enhanced for improved ride, handling, and quietness. Much of its engineering is shared with the Santa Fe, produced by Kia’s corporate partner, Hyundai. Despite buyer preferences shifting toward compact crossovers, midsize-SUV sales are up about 6 percent through the first half of 2017. Kia, however, hasn’t been among the beneficiaries: Sorento sales are down about 12 percent. With the 2018 version largely a carryover, those fortunes aren’t likely to change much until buyers get a chance to consider the freshened 2019 model. It won’t be a complete redesign, but the 2019 Sorento will be a noticeable departure from the ’18. Expect revamped interior and exterior styling. Its available V-6 engine might go away in favor of a turbocharged four-cylinder. And desirable driver-assistance features may become standard across the board instead of optional, as they are on most ’18 Sorento models. Don’t dismiss the 2018 Sorento, though. 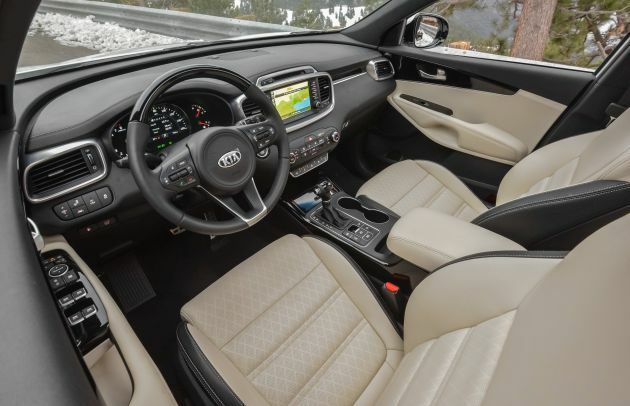 Despite a third-row bench seat that’s neither as comfortable nor as easy to access as that in most competitors, today’s Sorento still looks good, drives well, and follows Kia’s tradition of lots of features for the money. Sorento’s 2018 lineup is again defined by the three available engines, a 2.4-liter four-cylinder, a turbocharged 2.0-liter four-cylinder, and a 3.3-liter V-6. The lineup begins with 2.4 models in L and LX trim; continues with the EX 2.0T; and tops out with LX V6, EX V6, SX V6, and SXL V6 trims. Front-wheel drive is standard across the board. Traction-enhancing all-wheel drive (AWD) is a $1,800-$2,790 option on all but the entry-level 2.4 L. The 2.4 L, EX 2.0T, and the front-drive versions of the LX 2.4 seat five passengers. All other models have a third-row bench seat, expanding capacity to seven. Kia operates on tighter profit margins that most other automotive brands, so don’t expect much of a discount off sticker price. Keep in mind, however, that a Sorento will usually carry a lower sticker price than a comparably equipped rival from Ford, General Motors, Nissan, or Toyota. The South Korean carmaker also tends to offer cut-rate financing for longer-than-usual terms, such as 0% interest for 66 months, rather than the typical 60 months. Finally, Kia bolsters its brand appeal with generous bumper-to-bumper, powertrain, and roadside-assistance warranties. The 2018 Sorento looks the same as it did when the current-generation model debuted for 2016. It sports the latest iteration of the brand’s signature “tiger nose” grille. Swept-back headlights impart a decidedly European flair, which is unsurprising given that Kia’s head of design used to work for Audi. Uplevel models include four individual LED fog lights on each side, arranged in an ice-cube tray pattern, a look that Kia brought to the latest version of its compact-class Sportage crossover. Sorento is among the smaller midsize crossovers to offers seven-passenger seating, and this is most evident in the third row. Access requires some contortion, even for kids, and once they’re situated back there, they won’t have terribly much headroom or legroom. The story is better in the first two seating rows, where space is more competitive. Drivers will enjoy a comfortable seating position behind large, bright instrumentation. The standard audio interface on L and LX models is basic but functional. Optional on the LX and standard on all EX variants is a 7-inch touchscreen that includes Kia’s user-friendly UVO infotainment system with support for Apple CarPlay, Google Android Auto, and GPS mapping from a connected smartphone. Imbedded GPS navigation is standard on the SX and SXL, along with a bright, high-resolution 8-inch touchscreen. Sorento is a bit unusual in its class because it offers three different engines. Its four-cylinders are borrowed from the five-passenger Hyundai Santa Fe Sport. Its V-6 — the choice of the overwhelming majority of buyers — is the shared with the seven-seat Hyundai Santa Fe. Sorento’s 2.4 L and 2.4 LX models reprise a 2.4-liter four-cylinder with 185 horsepower and 178 pound-feet of torque. The EX 2.0T has a 2.0-liter turbocharged four with 240 horsepower and 260 pound-feet of torque. All V-6 models have a 3.3-liter with 290 horsepower and 252 pound-feet of torque. 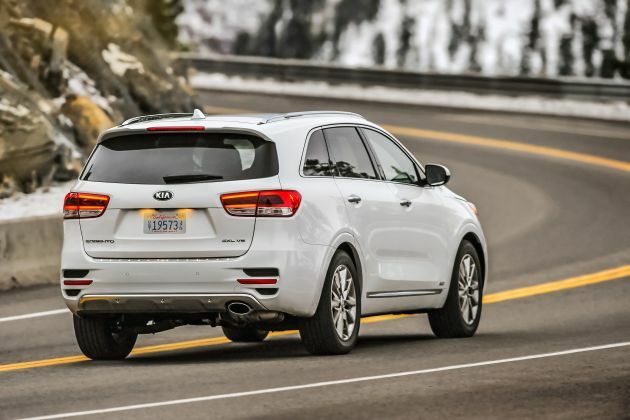 In a competitive set that is increasingly moving to 8-, 9-, and even 10-speed automatic transmissions (along with continuously variable gearboxes), Sorento’s 6-speed automatic feels a bit behind the times. Look for Kia to update to an automatic with additional ratios as part of the model-year 2019 refresh. 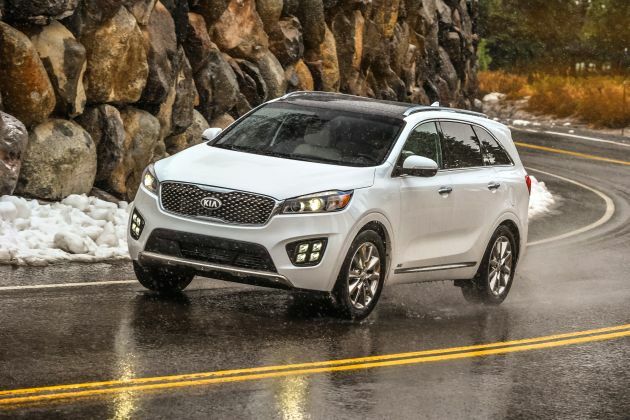 The 2.4-liter engine isn’t quite enough to move the somewhat portly Sorento with much gusto, especially if you frequently need to merge into fast-moving traffic. The 2.0-liter turbo is surprisingly robust, especially since it produces more torque than the V-6 (260 pound-feet versus 252) at a lower RPM (1,450-3,500 versus 5,300). We honestly wouldn’t be surprised if Kia drops the V-6 entirely from the 2019 model, especially in light of ever-increasing fuel-economy standards. This isn’t to say that the V-6 is no good, far from it. It’s plenty powerful and very smooth, but as with the other engines, the 6-speed transmission feels like it’s holding the vehicle back from achieving its maximum potential. Sorento’s overall road manners fall short of the lofty standards set by the Honda Pilot and larger Dodge Durango. The Kia’s suspension isn’t as taut as its main rivals, which can have it feeling at odds with the low-profile 19-inch tires included on the SX and SXL. The 17-inch tires on the L and LX and the 18s on the EX deliver a plusher ride. The steering lacks precision on all models, but that shortcoming probably isn’t a deal-breaker for most Sorento shoppers. The majority of Sorento models get at least some new standard equipment for 2018. The L now includes a rearview camera and automatic on/off headlights – two features that were previously unavailable. Still, this trim level is geared more toward rental fleets and is not typically stocked by dealers for retail sale. Most buyers will start their shopping experience with the LX. For the most part, this trim level has the same features as the L, with the benefit of some extra sound insulation, but you can order a number of option packages that include valuable safety and convenience features, which we will talk about below. The five-seat EX 2.0T and seven-passenger EX V6 versions gain a hands-free power rear liftgate, power-folding exterior mirrors, and wireless garage-door transmitter as standard equipment for 2018. This goes alongside their included blind-spot alert with rear cross-traffic detection, leather upholstery, heated front seats, dual-zone automatic climate control, CarPlay and Android Auto support, and keyless access with pushbutton engine start. The SX V6 adds imbedded GPS navigation, rear-obstacle detection, 14-way power driver seat with two-position memory, and a power panoramic sunroof. The SXL V6 comes fully equipped with ventilated front seats, Nappa-brand leather upholstery, a heated steering wheel, upgraded audio system, surround-view camera, and a full complement of driver-assistance features, including radar-based adaptive cruise control, forward-collision alert with autonomous emergency braking, and lane-departure warning. As detailed below, these safety aids are available on most other Sorentos, and models so equipped qualify for Top Safety Pick status from the Insurance institute for Highway Safety. Sorento falls short of the IIHS’ most prestigious Top Safety Pick+ honor because headlight performance fell short of IIHS test requirements. Most 2018 Sorento models see a modest price hike of $200-$300, depending on trim level. An exception is the AWD LX 2.4L, which is $1,190 more expensive because seven-passenger seating is now standard rather than optional. Regardless of which model you pick, Sorento’s pricing tends to track several hundred to several thousand dollars less the comparably equipped rivals. And note that all base prices here include Kia’s $940 destination fee. Base price for the EX V6 is $35,040 with front-drive and $36,840 with AWD. For the SX V-6 it’s $40,040 with front-drive and $41,840 with AWD. The range-topping SXL V6 starts at $45,340 with front-drive and at $47,140 with AWD. Available on the 2.4 LX is the new Cool & Connected Package, which Kia is offering for no extra charge. It includes dual-zone automatic climate control and Kia’s UVO infotainment with CarPlay and Android Auto. Note, however, that selecting the Cool & Connected Package prohibits you from ordering any other options for a 2.4 LX. Among those are the $1,700 LX Convenience Package, which includes everything in the Cool & Connected Package plus rear-obstacle detection, 10-way power driver seat, heated front seats, and a leather-trimmed steering wheel and gearshift knob. Ordering the Convenience Package allows you to add a third-row seat for $1,490. These two items are required to get the $1,500 LX Advanced Technology Package, which includes the aforementioned driver-assist features, an electronic parking brake, and an upgraded instrument cluster. LX V6 models have their own Convenience Package for $2,500 that includes all items in the 2.4L’s version plus blind-spot alert with rear cross-traffic detection. The Advanced Technology Package is the same as the 2.4L’s also but only costs $1,000. EX 2.0T and V6 versions offer the $2,900 Advanced Touring Package that includes driver aids, panoramic sunroof, LED interior lighting, and a 110-volt power inverter for plugging in a computer or other high-draw electronic device. SX versions have a $2,000 Advanced Technology Package with driver assists, auto-leveling high-intensity discharge (HID) headlights, ventilated front seats, and a heated steering wheel. There are no factory option packages for the SXL. Kia deserves credit for at least offering automatic braking, adaptive cruise, and lane-departure warning on almost all of its models, but we wish they were standard on more than just the most-expensive one. As far as the best value of the line, our nod would go to the AWD EX with Advanced Touring Package, which would carry sticker prices from $38,640-$39,470, depending on whether you want the five-seat turbo four-cylinder or seven-seat V6 version. If you’re looking at higher-end rivals, such as the Ford Explorer Platinum or Honda Pilot Elite, the Sorento SXL is a compelling offering that could save you thousands. EPA fuel-economy ratings for 2018 are unchanged from 2017. Front-wheel-drive models rate 21/28/24 mpg city/highway/combined with the 2.4-liter four-cylinder, 20/27/23 mpg with the 2.0-liter turbo, and 18/25/20 mpg with the V-6. Ratings with all-wheel drive fall to 21/25/22 mpg with the 2.4, 19/25/22 with the turbo, and 17/23/19 with the V-6. All engines use regular-grade 87-octane gasoline. Sorento’s slightly heavy curb weight and 6-speed automatic transmission conspire to keep its fuel-economy ratings below average. Kia’s designers and engineers are at work preparing a freshened Sorento that we expect will debut in calendar 2018 for the 2019 model year. It will sport revised styling and hopefully include all driver assistance features as standard instead of optional. It’s unlikely, but we wouldn’t be surprised if Kia expanded availability of the 2.0-liter turbocharged engine to more models, if even going so far as to axe the V-6 entirely. Regardless, the archaic 6-speed transmission should go away in favor of an 8-speed, which will improve drivability and boost fuel economy. Dodge Journey, which is less expensive but lacks key safety and convenience features available on every other midsize crossover; and the five-seat Nissan Murano and its more conservative seven-seat Pathfinder cousin, the former of which has polarizing styling and, along with the Pathfinder, suffers some performance quirks from its continuously variable transmission. Dodge Durango, which is larger and less fuel efficient but is based on a rear-wheel drive design for better handling, and offers fire-breathing V-8 power; Honda Pilot, the segment benchmark for road manners, though Honda’s packaging decisions may have you spending more than you want in order to get key convenience and safety features; and Toyota Highlander, which is more comfortable and refined, and comes as a frugal – if expensive — gas/electric hybrid.